Is Persisting Sin Our Identity And May We Offer It To God? (R. Scott Clark – Abounding Grace Radio) A complex question came over the electronic transom this morning. 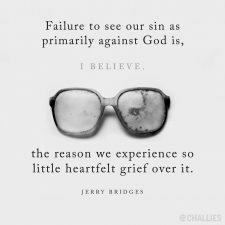 It has at least two parts: (1) Is persistent sin (e.g., sexual sin or desire) our identity, who we are; (2) Does the Lord want us to offer this sin to him? The question arises out of the recent Revoice conference and other sources, where it has apparently become fashionable (1) to identify one’s self by one’s persistent sins; (2) to offer that identity to the Lord as a sacrifice as though one is giving up something truly valuable in order to follow Christ. For we know that the law is spiritual, but I am of the flesh, sold under sin. For I do not understand my own actions. For I do not do what I want, but I do the very thing I hate (Rom 7:14–15; ESV).